10. Not answering Bri until she's yelled your name at least 5x before saying "what??? No, I didn't hear you!" 9. Start randomly "wiping out" for no apparent reason. The more dramatic the wipe out, the more fun. Boys LOVE to dive bomb the ground at any chance they get. 8. Use as much space as possible with everything you do. There are no boundaries to living space. Girls are cool with chilling in the corner to play but boys need the ENITRE room! 7. Hands are either down the pants or up the nose MULTIPLE times of the day. 6. Start maximizing the usage of sound effects in daily conversation. 5. Use the couch to builds forts. 4. While watching a good movie, randomly leave to act out the latest scene. Sound effect usage will be used heavily here!!!! 3. Leave the toilet seat down and pee not only on it, but also on the surrounding floor and walls. 2. Find a good cape or super hero outfit and practice "flying" around the house as you defend good vs evil. 1. Continue to tell her daily how much you love her because the boys do love their moms:) It just takes one "I love you mommy" to make everything all right in the world. We had another nice weekend - Little Uno & Big Deuce swims were on Saturday. The water was surprisingly not too hot. I opted for the Little Uno this year as I have not been swimming a whole lot and just wanted to take it easy. Yes, I am slow. Fellow Master's swimmer on Friday: "Wow, Bri. You got slow!" Yes, I am starting to show. Multiple people at the swim: "I can see your belly" or "Yup, starting to show." We had a bunch of friends/fellow athletes help us out on the volunteering front. THANK YOU!! Without all of you, these swims wouldn't go on. And I will not rant about competitors and t-shirts. I will not rant about competitors and t-shirts. You'd think we were giving out gold bars or something. Marty and many others went for a long bike ride in the 100+ degree heat. I went home and sat on the couch while watching the tour and holding Tassie's paw. Saturday night = birthday party. Lots of fun. 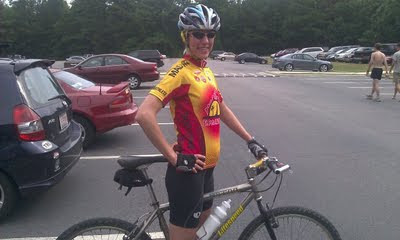 Sunday I went for a bike ride on the bridle trails at Umstead with Marty (after he ran). Again, it was hot, but we went easy. Sunday evening = trip to the Flying Saucer. Marty is closing in on his plate in the ring of honor. After drinking 200 different beers (counting 3 per visit), you are immortalized on the wall with a plate that has your name on it and a slogan of your choice. I think Marty is at 195 after last night. Upcoming = VACATION!!! Last year we had a great time doing a bike tour along the Erie Canal in upstate New York, so we were thinking of doing another somewhere else. We discussed options and looked into several and decided on one in Rhode Island in late September. Literally the day before Marty sent in the deposit, we found out I was pregnant. Marty thought, no biggie, but I told him that with my limited knowledge on pregnancy, I didn't think doing a bike tour when I was 6+ months pregnant could be filed under 'things that are safe.' He didn't believe me, but he did believe google, so we bagged that trip. Instead, we decided to go up to Boston since neither one of us have spent much time up in the Northeast. One our good friends and long time athletes also lives there so we'll get to spend time with her and her family. We're going to Cape Cod for a few days with a day trip to Martha's Vineyard, into Boston, then up to Maine for a few days. I can't wait. PS...that should say "so much fun..."
I like this update fwiw. I like it because it is different, from what I can tell, than most of yours. You can tell you becoming a mother has changed you. You are telling us "other" things are more important to you, than what I have read in the past. 1, 3, and 9 on that list are especially on point. Have fun on vacation! I can verify for you that the boys have indeed done everything on that list...multiple times. Recently we are stuck in the build a fort with couch cushions and dive bomb on the floor.